South Dade High school guitar phenom AJ Gaytan & local band The Catch to open for legendary blues artist Charlie Musselwhite. The Seminole Theatre is proud to serve the mission of both bringing world class artists to Homestead and featuring talented local performers. On Thursday, March 31st, we have the opportunity to do both. Local guitar player, signer and all around performer AJ Gaytan hails from South Dade Senior High School and has quickly gained notoriety in the community. He has been seen playing all over the county with various bands and recently opened for Los Lobos. Gaytan plays with the soul of a musician far beyond his own years. He'll be teaming up with band The Catch to show off some blues repertory, opening for blues harmonica legend Charlie Musselwhite at the historic Seminole Theatre. Fifty years of nonstop touring, performing and recording have reaped huge rewards. 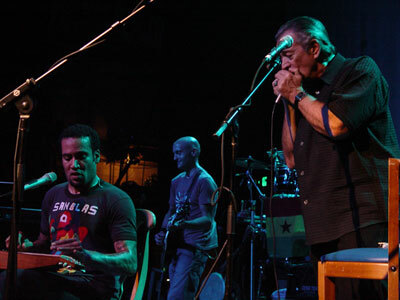 Charlie Musselwhite is living proof that great music only gets better with age. This man cut his (musical) teeth alongside Muddy Waters, Howling Wolf and everyone on the south side of Chicago in the early 1960’s – thank your lucky stars he is still with us telling the truth with a voice and harp tone like no other. Charlie Musselwhite may be the only musician to get a huge ovation just for opening his briefcase. Fans know that’s where he keeps his harmonicas and they’re about to hear one of the true masters work his magic on the humble instrument. Musselwhite is, and always will be, a bluesman of the highest order. But he’s taken blues harp from the clubs on the Southside of Chicago (where “Memphis Charlie” and Mike Bloomfield backed Big Joe Williams) to places it’s never been before, both musically and physically. He’s soloed to “Girls Just Wanna Have Fun” with Cyndi Lauper on Good Morning America; wailed on “Echo Bells” with Japan’s Kodo drummers (produced by the Grateful Dead’s Mickey Hart); and mixed blues with Cuban son legend Eliades Ochoa, each playing on the other’s album. He’s jammed on stage with Mick Jagger and recorded with such diverse artists as INXS, Tom Waits, bluegrass fiddler Vassar Clements, gospel Blind Boys of Alabama, and even Cat Stevens. And shortly before winning the Grammy for Best Blues Album for their collaboration Get Up!, he and Ben Harper played at the White House for President Obama and the First Lady, in a salute to Memphis soul. Don't miss out - reserve your tickets NOW. Click Here.